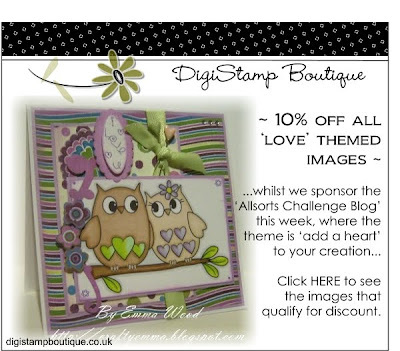 Just a quick post tonight to share a card I have made with Bernard from the DigiStamp Boutique, who, along with a few other love theme images are on special offer at the mo'. Very cute image, lovely sentiment, great papers. That's it!! I've had it with you and your constant paper stash taunting! I am on my way! This is so cute! Wonderful image, and the papers suit it so well! very cute image. Thank you for joining the Allsorts challenge this week and good luck. Super cute card. Love that big beautiful bow and how you put the ribbon behind the image. Great job. I realy adore the paper you've used on the this card, but Bernard and your coloring steal the spotlight. Such a wonderful card.